As a reminder, consider printing the DRIVE ON LEFT in Australia card on this page and put it in your car where you can see it. You can also ask your hire car provider, tourism outlet or any Service SA customer service centre for a card and information about driving in SA. 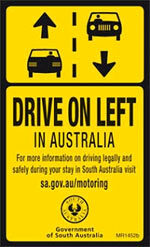 If you are a SA company providing services to visitors you can order Drive on Left and road rule promotions here. To get used to the feeling of driving left, try our online hazard perception test to get used to driving scenarios. Find out more about road rules and road safety tips for international visitors in the tabs below. Short term visitors with temporary visas can drive in SA but must only drive the type of vehicle authorised by their licence. You must carry a current driver's licence issued interstate or overseas at all times. If the licence is not in English you must carry an International Driving Permit or an English translation. If the licence expires whilst you are here or you become a permanent resident you must apply for a SA driver's licence. Seatbelts and child restraints must be worn where available in vehicles. Seatbelts reduce the risk of injury and death in a crash significantly. There are also heavy fines for not wearing a seatbelt or restraint. If you are riding on a motorcycle, moped, motor scooter or bicycle, (also non-motorised scooter in Victoria and South Australia) you must wear a crash helmet. Speed limits are strictly enforced in Australia. The speed limit is the maximum driving speed allowed. You must not drive above this limit. Some roads and streets don't have speed limit signs, but speed limits still apply. As a general rule on roads where there are no signs but there are street lights or houses or other closely spaced buildings next to the road, the speed limit is 50 km/h. Where there are no signs or street lighting or houses or buildings next to the road the speed limit is a maximum of 100 km/h in most states and territories. If the weather is poor (raining, fog) make sure you drive slower. All states and territories have mobile speed cameras, so slow down, drive safely and avoid heavy fines. Driving after you have consumed alcohol is dangerous. Australia has strict laws and penalties on 'drink driving' and police actively enforce them through random breath testing programs. 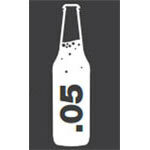 If you have a full driver's licence you must not drive if your blood alcohol level is 0.05 per cent or higher. At 0.05 per cent blood alcohol concentration, your risk of being involved in a crash doubles. Driving after taking drugs that affect your ability to drive is illegal in all states and territories; penalties are severe. You are not permitted to use a handheld mobile phone when driving. This includes making or receiving calls, sending a text message, playing games and/or web browsing. Drivers must give a minimum of 1 metre when passing a cyclist where the speed limit is 60 km/h or less, or 1.5 metres over 60 km/h. Road conditions can vary from a sealed surface to gravel and dirt. Use a four-wheel drive vehicle on unsealed roads in remote areas. Be careful of holes, soft road edges, narrow roads with unstable edges, narrow bridges, changing surfaces and dusty roads. The environment can change rapidly. Always check on local road conditions before leaving major roads. Turn your vehicle's headlights on low beam during the day so vehicles can see you. Drive slowly on unsealed roads and take extra care – loose surfaces are unpredictable. If you drive off the side of the road, do not overcorrect but slow down and return to the road when the vehicle is travelling at a safe speed. Obey road closure signs. You may come across water on the road. Roads may be covered in water which appears shallow but can have a current strong enough to sweep your vehicle away. Wait until the water level drops or use an alternative route. Watch out for animals on the road such as kangaroos and emus. Livestock also graze on the side of unfenced roads. The most active time for many animals is sunrise and sunset. If an animal crosses in front of you, reduce speed safely and do not swerve violently or you may roll the vehicle. Huge trucks, known as road trains, can be the length of 10 cars. It can take up to 2.5 kilometres to overtake a road train at 100km/h. Also allow plenty of room before you overtake as they may sway from side to side as you overtake. Be prepared for the 'windrush' when passing as it can pull you towards the road train. When being overtaken by a road train, maintain your speed and don't move off the road. Only slow once the road train moves out to pass and make sure there is space for the road train between you and the vehicle in front of you. They can connect you to Police, Ambulance or the Fire Brigade. You should only contact 000 in an emergency. Familiarise yourself with the Road Rules in South Australia in more detail. Contact the Royal Automobile Association (RAA) for advice about roadside assistance in South Australia. View Australian Explorer to find out about the distances between some of the major towns, cities and areas within and around South Australia. To find out about the distances between major interstate centres in Australia, use the following Time & Distance Calculator . If heading towards the north of the state, check the temporary road closures, restrictions or warnings for outback roads. Check the South Australian Tourism Commission's web page about safety tips for visitors driving in the outback and Flinders Ranges. Visitors driving in South Australia are subject to the same penalties for road traffic offences as other drivers. Further information on the penalties for road traffic offences. 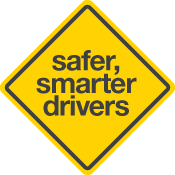 Check our safe driving tips section.